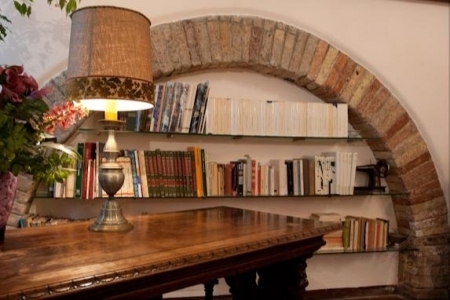 In this very bright suite, thanks to the two large windows and to the high arch ceiling, a row of stone arches, which was found during one of the renovations now hosts a library at guests disposal. All these elements together with the refined drapery, chosen and matched by the owners of the house, make this 48square-metre suite a room with a rustic taste but at the same time elegant. 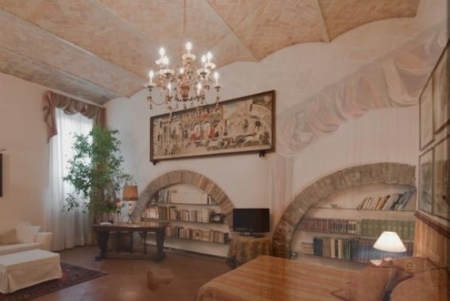 The sitting room composed of three sofas and an antique Venetian table is in the best position to admire the opposite wall which has a collection of over twelve lithographs and sketches of Ravenna’s painter Ruffini and which frame the master bed. The bathroom with handmade wooden pannelling has a double basin and a shower room.